The Potomac River—nicknamed the “Nation’s River” because it flows through the nation’s capital—meanders 383 miles from Fairfax Stone, WV to Point Lookout, MD where it contributes the second largest amount of freshwater to the Chesapeake Bay. Although it comes within one or two miles of the southern Pennsylvania border, not one drop of water in the Potomac River flows through Pennsylvania. 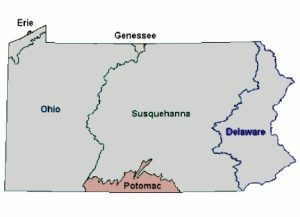 Pennsylvania is important to the watershed because many headwater streams that contribute to the Potomac or the Monocacy River form in one of seven counties in southcentral Pennsylvania. The Potomac River’s entire basin encompasses 14,670 square miles over four states: Pennsylvania, Virginia, Maryland and West Virginia, and the District of Columbia. The 1,584 square miles of Somerset, Bedford, Fulton, Franklin, Adams, Cumberland, and Perry counties that drain into the Potomac River are only 3.5 percent of the state’s land area, but account for 11 percent of the total basin. Approximately 5.35 million people live in the Potomac Region, 180,000 of them in Pennsylvania. The Potomac Basin experiences a moderate climate pattern, marked by cold winters and warm, humid summers. A majority of the region has a mean minimum temperature of 18 to 19 °F and a mean maximum temperature of 82 to 85 °F. Temperature regimes remain relatively constant throughout the region with the Somerset and Bedford County areas exhibiting the greatest variance between minimum and maximum average annual temperatures. Precipitation in the region is normally adequate to plentiful throughout the year. The region receives half of its precipitation during the growing season (with May being the wettest month). Winter precipitation consists of a mix of snow, freezing rain and rain. Average annual precipitation for the Potomac Region ranges between 34 and 49 inches—the eastern half of the region generally receives more precipitation than the western half. The area surrounding the Franklin/Adams County border receives the greatest amounts of precipitation, averaging between 42-43 inches up to 46-49 inches of precipitation per year.